First, we suggest you have each employee complete an HSA Authorization Form to make certain of their requests. If you would like one custom branded for your organization, let us know. 1. 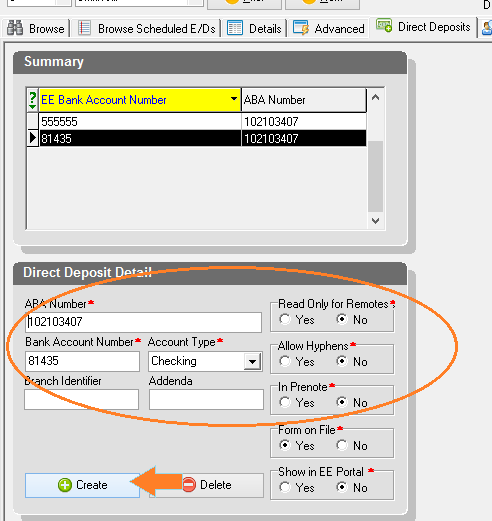 Create the bank account on the Employee-Scheduled E/D's: Direct Deposit sub-tab just as you would when setting up normal direct deposit. 4. Finally, on the far right of the screen under "EE Direct Deposit" is a drop down. Link the banking details for the account to the code. 5. Save changes. 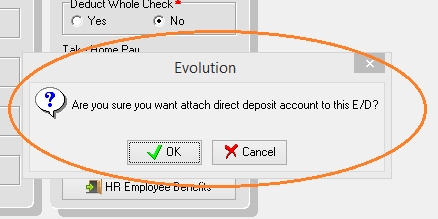 You'll be prompted a warning: "Are you sure you want attach direct deposit account to this E/D? 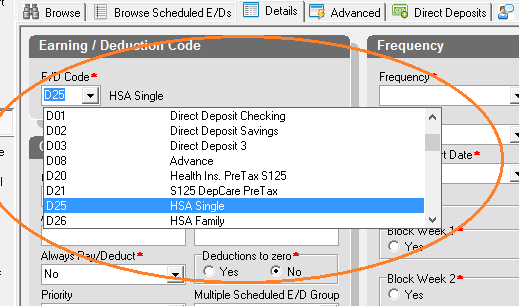 "; hit Ok.
- HSA's should be split out based on Single or Family as to not exceed the IRS limits. The software will auto-stop once a limit is reached. - Employee's should only use Family limits if they have the appropriate coverage; regardless of whether they have a family. - If you have both employee & employer HSA types in one year, please let us know so we may link the two and prevent exceeding the limits.